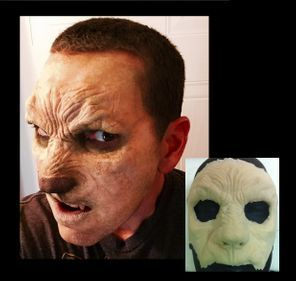 Haunts Fx is a full service Special Effects Studio located in Southern Louisiana specializing in highly detailed professional foam latex appliances, applied special effects makeup services and theatrical prop design and fabrication. You may contact Haunts Fx by email or phone and we will get back to you as soon as possible. All of our foam latex appliances are sculpted and designed with the most realistic detail available. We use only the most durable softest hot latex foam system on the market to produce a comfortable to wear appliance without loosing any expressions. All of our appliance edges are thinned to help with the application and blending process. Our appliances will accept all types of body paint or FX Makeup on the market. All appliances may be reused if care is taken during removal and properly stored. We do not recommend sharing prosthetics between two or more wearers for hygentic purposes. Haunts Fx has all the knowledge, skills and tools to produce astounding special effects makeup for your next project. Doesn't matter if you own or operate a Haunted Attraction, Shooting a Film or have a Theatrical performance needing makeup services we can help. Our friendly staff and Makeup artist will work one on one with you to make sure your needs are met. Haunts Fx highly skilled craftsman can design and fabricate props and costumes to meet your needs. Doesn't matter how big or small your project is, Haunts Fx will tackle them all the same way with out loosing any quality of craftsmanship.